A total of 94 studios have been selected to take part in this year’s Spring Fling – Scotland’s premier open studio weekend. Spring Fling is a much loved feature of the country’s arts and cultural calendar, attracting more than 10,000 visitors a year from across Scotland, the rest of the UK and overseas – and generating over £1.2 million for the regional economy. It’s a chance to meet high quality painters, original printmakers, ceramicists, jewellers and glassmakers, wood and metal workers, photographers in the places where they live and work. Joanna Macaulay, Events and Exhibitions Manager for Upland which runs Spring Fling, said: “We have an amazing range of artists and makers taking part this year – really underling why Spring Fling has become such a popular and successful part of Scotland’s arts scene. “As ever it’s a chance to meet some remarkable people, visit some extraordinary homes and studios and explore one of the most beautiful parts of Scotland. 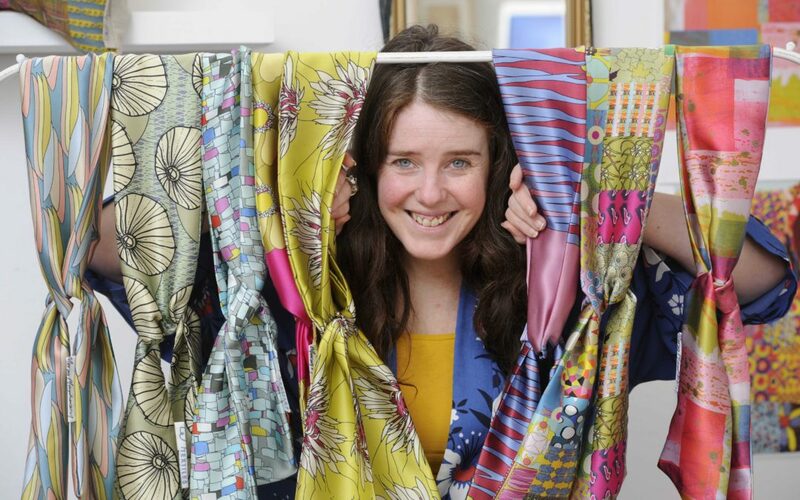 Many exhibitors are well known at home and abroad such as glassmaker Amanda Simmons and slipware makers Fitch and McAndrew from Corsock, award-winning wildlife artist Lisa Hooper, of Port William, as well as Kirkcudbright textile designer Morag Macpherson and willow weaver Lizzie Farey. From elsewhere in the region there are the visual artist Bea Last of Kirkgunzeon, Harry Potter book illustrator Clare Melinsky, based near Thornhill and Waterbeck husband and wife Heather and Colin Blanchard – a painter and printmaker. As ever Spring Fling will be welcoming fresh talent, with 13 new faces. Some, like David Rushton in Sanquhar, who creates scale models of building interiors, or abstract painter Glenda Waterworth (one of three artists in Drummore near Stranraer), are well-established. Others are in the early stages of their careers. In 2019 this will include Jordan Chisholm (performance artist) and Sarah Rogers (jewellery) as part of Upland’s Emerge bursary scheme, which provides business and arts mentoring. There will also be Jennifer Hastie (mixed media) and Heather Spicer who are benefiting from Upland’s New Graduates Scheme to support people during the transition from studenthood to career. Spring Fling also makes space each year for artists from neighbouring regions – including Cumbria, Northern Ireland, Ayrshire and the Borders as well as Springbacks, who have connections with the region but are based elsewhere. For 2019 there will be mixed media artist Kate Mink who now lives in California. A pop up exhibition is planned from 5 to 13 April at The Oven in Dumfries to give a foretaste of all that’s on offer. An exciting and inspiring public artwork, called the WaterOrgan, will quite literally be launched as part of the Spring Fling weekend. This year’s Spring Fling is supported by EventScotland, part of VisitScotland’s Events Directorate. Paul Bush OBE, Director of Events for VisitScotland, said:“EventScotland is delighted to once again be supporting Spring Fling through our Beacon Programme, with funding going towards public artwork WaterOrganand the event’s studio workshops. For further details on Spring Fling please visit www.spring-fling.co.uk. Spring Fling is Scotland’s premier visual art and contemporary craft open studios event covering all Dumfries and Galloway, South West Scotland. It is the flagship annual event of Upland CIC. Last year 99% of visitors described their Spring Fling experience as excellent or good. The studios welcomed over 31,000 unique studio visits during the three-day event in 2018. More than half (56%) of visitors came from outwith the region – underlying its value to the cultural tourism industry. Together they generated £1.2 million for the regional economy. This year, a new joint marketing partnership with Dumfries & Galloway Arts Festival will be launched. More information to follow. work to the benefit the local economy and the sustainability of local communities. Its funders are Creative Scotland, D&G Council, Holywood Trust, The William Grant Foundation, ASWT, Barfill. Upland is very happy to help journalists. Contact us and we can set up interviews, provide pictures and photo opportunities. In some circumstances we can offer ready-written copy. For media information contact Matthew Shelley on 07786 704299 or at Mjhshelley@hotmail.co.uk or call Upland on 01387 213 218.